In addition to being able to design and install new electric barriers, we can fix existing ones. Any current installations of electric gates, automated garage doors and intercom systems that have broken in someway, can be fixed by us. We also have the necessary skills and know-how to fix standard garage doors and gates. 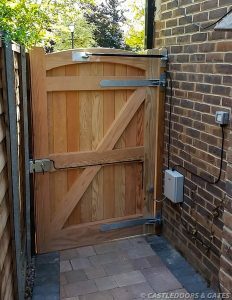 We can carry out electric gate repairs and maintenance on all the barriers installed on your property, even if they were not originally installed by us. Our expertise is such that we will still be able to repair them and ensure you will be satisfied with the result. We will undertake repairs on all aspects of your gates and garage doors. We can repair both automated and manual barriers – regardless of the issue that has caused them to require repair. We know that there are a range of issues that can cause an electric door or gate to suffer a defect and fail, and we have the capability to repair them all. We can deal with any problem from misaligned parts causing mechanical problems to failures with the electronics. Let us assist and get your gates and doors working like new. After carrying out an inspection, we will advise you about the necessary actions for the repair of your gates or garage doors. We will then give you a complete estimate. Our prices are reasonable and our service is excellent, stemming from many years’ experience in the industry. We also give a generous guarantee with all our work. Castle Doors & Gates is conveniently located in Kent. We operate throughout London and the South East including Chatham, Gillingham, Maidstone, Ashford, Sevenoaks and Sittingbourne.